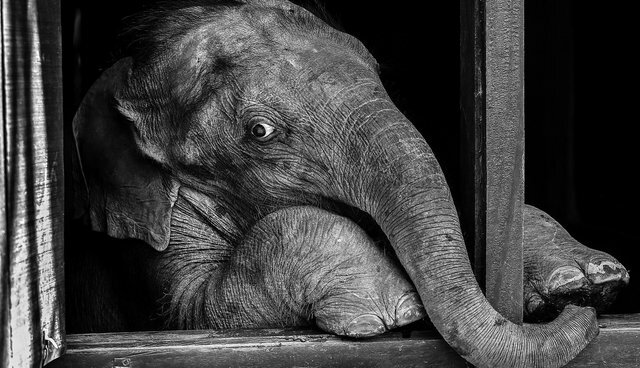 Over the years, I've had so many people ask me about this orphan elephant portrait. Many were curious about the story behind it. I met this baby elephant while documenting a baby elephant and rhino rehabilitation and relocation program in Assam, India a few years ago for the International Fund for Animal Welfare (IFAW). It had been separated from its mother during a flood and the IFAW / Wildlife Trust of India (WTI) Center for Wildlife Rehabilitation and Conservation had rescued it and was preparing it to be integrated into a family of orphaned elephants at the rehabilitation center. Because it was so young, it was still being bottle fed and was therefore kept separate from the older orphans. Elephants are extremely intelligent and social animals and have close life-long relationships with family members just as us humans do. One morning, I photographed this elephant being bottle fed and was struck by its need to connect ... with the person who fed it, with me, even with the baby buffalo it was sharing a pen with. Its long, sensitive trunk explored every smell and texture it could find. At one point, it came right up to me and even appeared to be examining my camera closely, smelling and feeling the mysterious metal contraption. I couldn't help but laugh when it later went up to its pen-mate, the baby buffalo, and pushed it around a bit, as if to assert its intellectual and physical superiority. The baby buffalo stood there, unmoving, doe-eyed, utterly uninterested in this inter-species communication. 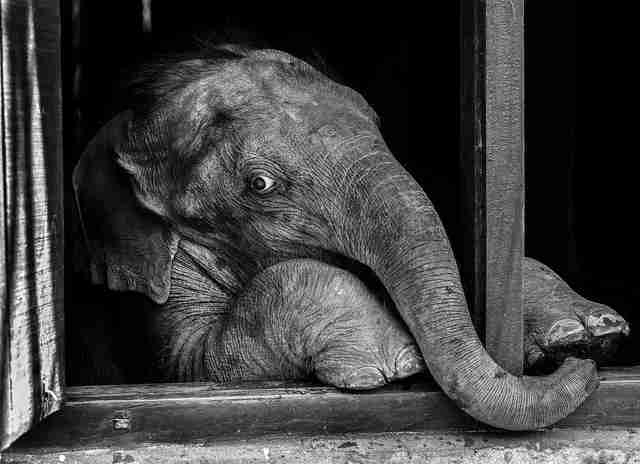 I photographed the little elephant many times during my stay there and by the time I left, I was completely charmed by him. On the last day before I left, I went to visit him for the final time to say goodbye. After I left, I turned around one more time to look at the building that housed the little elephant. I saw he had got up on his hind legs and was looking out the window directly at me. His expression was so strikingly human and profoundly expressive in that moment, I found myself feeling an intense connection. I made a few photos of him, struggling to leave. Later, when I saw this photo, I knew I would never see elephants in quite the same way again. The baby elephant was eventually integrated into a herd of orphaned elephants who were then released back into the wilderness. The last I heard they had made a good transition.